One of my medical billing clients is a clinical psychologist, who has a most delightful sense of humor. I knew she would appreciate the sentiment. So, I downloaded the file. I had the perfect fabric for it: a linen (or linen-like) in bubble-gum pink which could coordinate perfectly with the pink in the chocolates fabric. My original and very boring thought was to simply stitch the saying on the linen, frame it in the chocolates fabric for a throw pillow. But, in my wanderings in the internet, I happened to see a lovely patchwork pillow from Erina's Designs, at Oregon Patchworks. 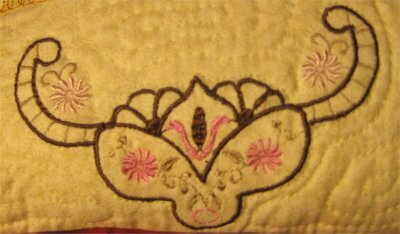 Using her pillow as inspiration, I created my own pillow with different embroideries for embellishment. Remember I mentioned that a lot of my embroidery designs were freebie samples? The problem with that is, although I document where the freebie came from, the very nature of freebies (and by extention, the internet) is that they are transient. 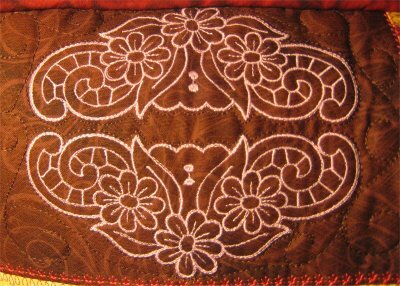 This embroidery looks like a cutwork design, but wasn't digitized to be one. Unfortunately, this was acquired before I started documenting where I obtained my designs. 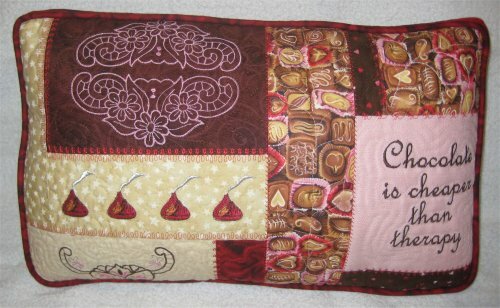 I can tell that the chocolate kisses came from Betsy's Wine Country Designs, Chocolate Decadence collection, but don't bother looking for it ... apparently she is no longer around nor is the file. That's really too bad because these are the best looking embroidered kisses! This embroidery came from Free Embroidery Files in July 2007 .. but their archives don't go back that far. And then the original text design that started this whole project? Well, after stitching the design onto the linen fabric, I decided it didn't look quite right. The letters didn't show up nicely against the linen texture. I don't know if the digitizer had a plain weave fabric in mind, but it just wasn't good enough on the linen to give as a gift. So, I looked through my collection of alphabets and, although I didn't have the one in the original file, I chose one that I liked and also had both upper and lower case. This particular alphabet is called "French Script"; the capitals are about 1" high. Unfortunately, that site where I got that specific alphabet from is no longer around, but a slightly larger French Script can be found at Ebony Elegance. I dived into my stash, looking for other fabrics to coordinate with the chocolates fabric and came up with a bunch. After I blocked out the general design, I went looking for pillow insert. The one I liked was 14"x28" ... too long for my taste, BUT because I am just so doggone clever, I simply shorted the pillow to 20". (The leftover bit was closed to make a really, really, really tiny rectangular pillow, which I have absolutely no idea how to use. :-) ) I finalized the blocks for the patchwork to fit the pillow insert and started sewing them together. After the patchwork was completed, I used (in one of rare times that I have!) 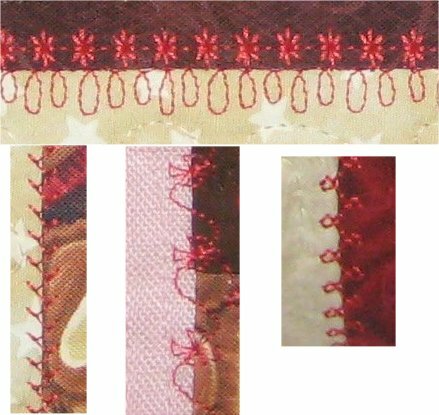 the decorative stitches on my Janome 6500 to overstitch the seamlines, kinda/sorta like a crazy quilt. I then made a quilting sandwich (top, batting and backing) and quilted the top on my Janome .. it was small enough to do that easily. Therefore, no zipper. Instead, I used an envelope closing on the back, which I really don't care for as much .. but it was the best solution to the problem at hand. The original plan was for a knife-edge pillow and that is what I made. The trick about pillows is that the insert needs to be slightly *larger* than the pillow covering, so that the resultant pillow is nicely plump. God forbid that we should have skinny pillows. I know this. I planned for it. 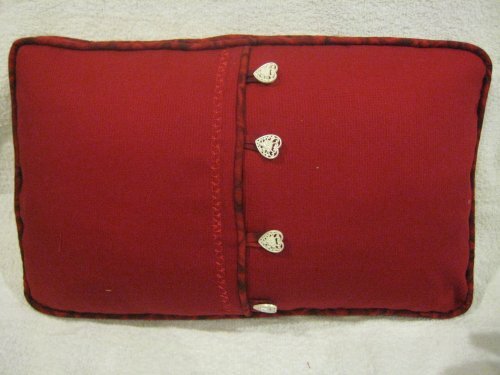 But in my age-induced shroud of mental fog, the pillow cover was made TOO DOGGONE SMALL for the pillow insert. Boy, I stuffed that sucker in there with a crowbar and managed to rip some stitches along the side. Ooops. I knew that wasn't going to make it. The recipient would 1) never be able to get the pillow insert out, much less 2) get it back in. Therefore, enter Plan 2: A box pillow. I ripped the pillow apart so that the top and backing were once more separate. I put an additonal welting along the backing and sewed a boxing strip between the top & the back, thereby creating a three-dimentional box. Oh hallelujah! The pillow insert now had enough room to fit inside *and* have a nicely plump pillow!